The candidates in all programs which were managed by Express Entry had a chance to receive an ITA. For qualifying, persons are first required to fulfill the criteria of the Federal-Skilled Worker Class, or Federal-Skilled Trades Class, or Canadian-Experience Class. The candidates are allotted a ranking score which is based on civil status details, education received, work experience gained, and proficiency in the language. This score determines their rank in the pool, and the highest-ranking candidates receive ITAs. Such Candidates can apply for Canadian PR status. Generally, the draws are held twice in a month, but sometimes the longest gap between two draws was 35 days from April 17, 2015, to May 22, 2015. It is interesting to note that the shortest gap between two draws was just 5 days from May 26 to May 31, 2017. Presently many ITAs are issued but in 2015 Total numbers of ITAs issued were 31,063 and in 2016 they were 33,782. Since the introduction of the system Total number of ITAs issued stand at 137,066. The change in score when compared to the previous draw held on September 20, 2017, is just 5 points. This opens the door for the aspirants and also meets the demands of growth for Canada. 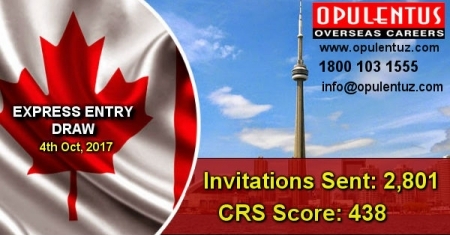 Immigrants who are seeking to immigrate to Canada can contact us at [email protected] or call us 1800 103 1555 for guidance and information regarding all immigration services. We at Opulentus, are ready to guide the aspirants, and have a pleasant record, of meeting our client's expectations for several years.